He named members of the apex court’s seven-judge bench, comprising the Chief Justice of India, Justices Dipak Misra, J Chelameswar, Ranjan Gogoi, Madan B Lokur, Pinaki Chandra Ghose and Kurian Joseph. In a direct face off with the Supreme Court, Calcutta High Court judge Justice C S Karnan, who is facing contempt charges, ‘sentenced’ Chief Justice of India J S Khehar and seven other judges of the Supreme Court to five years rigorous imprisonment. The bench had initiated suo motu(on its own) contempt proceedings against Justice Karnan and restrained him from performing judicial and administrative work. Justice Karnan also added another supreme court judge Justice R Banumathi in the list against whom the order was passed for having restrained his judicial and administrative work along with CJI Khehar. Justice Karnan had on May 4 declined to undergo a mental health checkup as ordered by the supreme court, telling a team of doctors he is “absolutely normal” and has a “stable mind”. He alleged that the eight judges “have operated judicial and adminstrative power and harassed a dalit judge besides insulting me at a public institution. The same has been proved beyond all the reasonable doubt from their orders. “Hence, an adjudication is not required in the instant case,” Justice Karnan said in his order from his makeshift court at his home in Rosedale towers, New Town here. 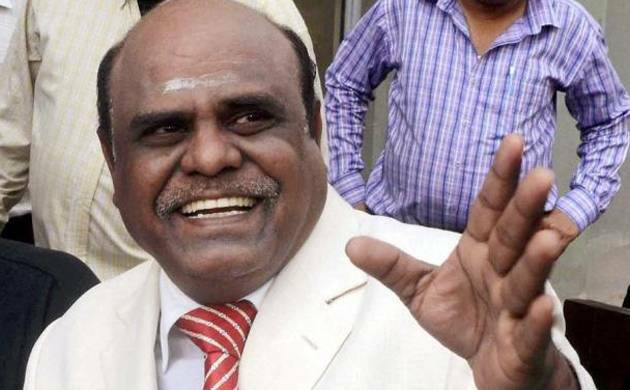 In his order, Justice Karnan imposed ‘sentences’ of five years each and a fine of Rs one lakh on three counts, under sub-sections (1)(m), (1)® and (1)(u) of Section 3 of the SC/ST Atrocities Act.